If you don't mind, I'd like to join the next round as well. Count me in as well please @jpastor. Spot Count for next game (6/8) got you three. Vote casting is not yet underway. Still waiting on 3 cards. You want in bro Fro? Still missing y'alls' card entry. You have until 1159 tonight. Voting Time Please message me with your vote on which Stephen Hawking card you like most of the 6 that were submitted aside from your own. I'll join for the next game if that is alright. We have our winningest cards! Recap of the Rules: One entry per cardsmith. You can edit until the last person submits their entry. You have 3 days to submit a card. Then you will have 1-ish day to cast your vote via a private message. Then I will announce winners. You get 1 favorite of your choice for each vote your card receives. Example of an actual Plane card. Using mtgcardsmith, you will need to make it an Enchant World with a colorless land border and common rarity. Use the name of the plane your place is on as the subtype. (For example: I named my place Shenosu, which is a made up place on Kamigawa.) A Plane has 1 to 2 abilities plus a Chaos ability. Feel free to double space in between your ability(ies) and the Chaos ability (as I did with mine). Here is my card as an example. Take your time formatting your card. Make it neat. Try to use Large font. Heyo! 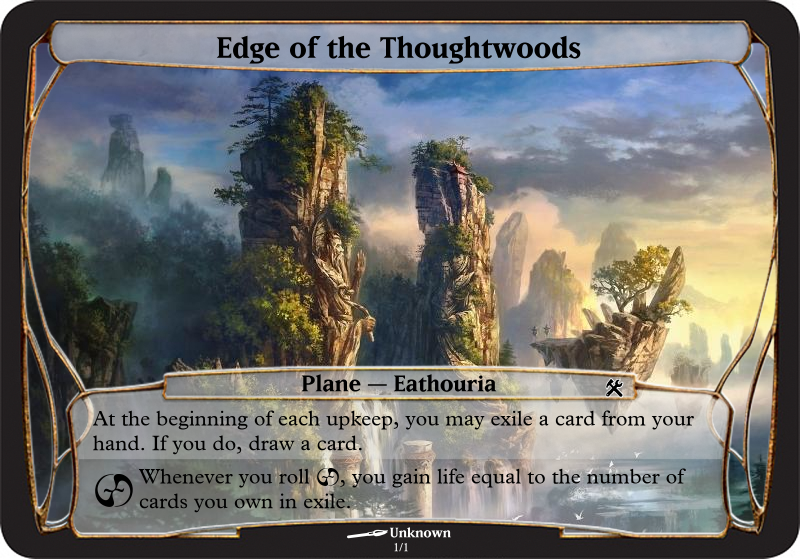 I'm here with a plane card from my custom plane, Eathouria! 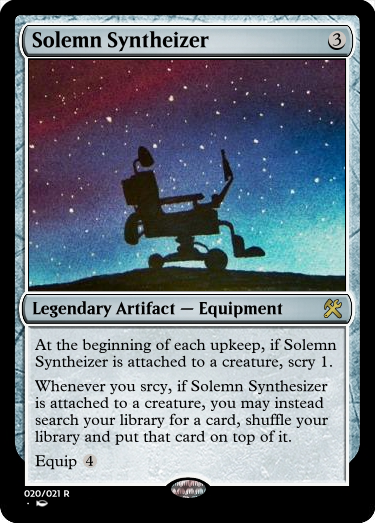 Where did you find the template for that card? I wanna try making my entry in MSE as well.